LILONGWE, Malawi, Mar 28 2016 (IPS) - The first successful test-flight of an unmanned aerial vehicle (UAV) or drone was an unhindered 10 km journey from a community health centre to the Kamuzu central hospital laboratory in the capital Lilongwe. 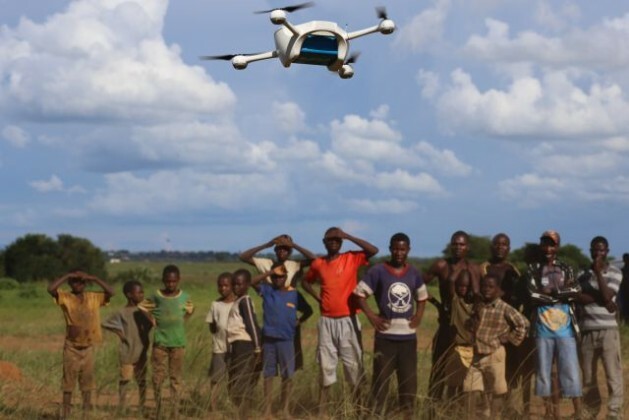 Local community members watched with excitement as the drone rose into the sky, after being launched by the United Nations Children’s Emergency Fund (UNICEF) and government of Malawi at the area 25 health centre. The first of its kind in southern Africa, the US manufactured machine was on trial till March 18 to determine if it could replace other modes of transporting dried blood samples from rural clinics to the main laboratories for early HIV screening in children. UNICEF together with the manufacturer — Matternet — hope this innovation will help solve logistical problems in Malawi’s rural areas due to the bad state of roads and high costs of diesel fuel, among others. Currently, motorcycles and ambulances are used to transport blood samples between clinics and take up to 11 days to reach the respective testing centers and two months for the results to come back. The longer the delay between the test and results, the higher the default rate of the patient. According to government figures, 10, 000 children died of Aids-related illnesses in Malawi in 2014. Screening of HIV in children with HIV positive mothers is a little more complicated than that of adults as it requires more sophisticated machinery, which is hard to access for most rural people due to distance. UNICEF and the Malawi government expect this machine, which is operated through a mobile phone app, will in the long run replace motorbikes and reduce waiting times for results, thereby cutting costs in accessing test results (and later treatment) if children are found HIV positive. Matternet’s machine will be carrying about 1 kg of the blood samples from rural clinics to main laboratories across the country. This is another innovation from UNICEF after it launched the rapid SMS programme in 2010 with the same aim of speeding up the process of HIV testing and treatment among children. The drones are said to be cheaper to run than motorbikes because they only need electricity to recharge the battery, unlike motorbikes which use a lot of fuel and need constant maintenance. Nevertheless, their purchasing costs could be a hindrance as each drone costs MK5 million (equivalent to US$7,000). Kumpalume furthermore noted that the new innovation was in line with the Malawi government’s 90-90-90 agenda: “Government intends to achieve the 90-90-90 target where 90 per cent of Malawians know their HIV status, to have 90 per cent of all those diagnosed with HIV receive sustained anti-retroviral treatment, and 90 per cent of people on ART to have viral suppression”, he said. UNICEF’s representative in Malawi, Mahimbo Mdoe, said HIV is still a barrier to development in Malawi. “In 2014, nearly 40,000 children in Malawi were born to HIV positive mothers. Quality care of these children depends on early diagnosis. We hope that UAVs can be part of the solution to reduce transportation time and ensure that children who need it, start their treatment early,” said Mdoe. Malawi has a national HIV prevalence rate of 10 per cent — still one of the highest in the world. An estimated 1 million Malawians were living with HIV in 2013 and 48,000 died from HIV-related illnesses in the same year. Whilst progress has been made, and today 90 per cent of pregnant women know their HIV status, here is still a drop off with testing and treating babies and children. The drone tests over the next week will measure the equipment’s performance with differing winds speeds, humidity and distance and if the results prove positive, the experiment will be expanded. The test, which is using simulated samples, will have the potential to cut waiting times dramatically, and if successful, will be integrated into the health system alongside others mechanisms such as road transport and SMS. UAVs have been used in the past for surveillance and assessments of disaster, but this is the first known use of UAVs on the continent for improvement of HIV services Matternet co-founder Paola Santana said it would be easier to use the machines in Malawi because of its closely located health structures. Apart from Malawi, UAVs are also being used in Haiti, Papua New Guinea and Switzerland.